Nagara Panchami, an important Hindu festival dedicated to Nagas or Snakes, is held on the fifth day of the Shukla Paksha or waxing phase of Amavasya in the Shravan month (mid July – mid August). Nagara Panchami 2019 date is August 5. The popular belief in Karnataka (especially in Tulunadu) in South India is that before humans appeared on earth, the whole earth was the home Nagas (serpents) and to accommodate human beings they went underground. Nagara Panchami puja is performed as thanksgiving to this kind act by the Nagas. The term Nagara Panchami is widely used in Karnataka. This festival is popularly known as Naga Panchami. On the Nagara Panchami day the main offering is a concoction made of sweetened milk mixed with honey and sugar. Early morning, places where there are Naga Murtis or Naga Parthishte are cleaned and decorated with flowers and turmeric powder. Special pujas are offered to the Naaga devas. Flowers of arecanut tree and flowers of fragrant screw pine are offered on the day. The monsoon season is at its zenith during the Shravan month when Nagara Panchami is observed. The burrows of the snakes will be filled with water and the snakes move to areas occupied by humans. The pujas conducted are to avoid snake bites and to keep the nagas happy. 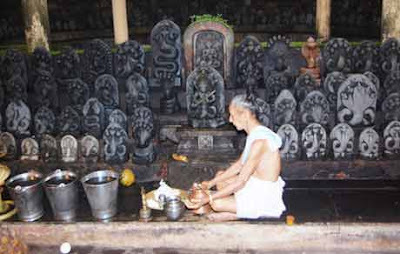 The most famous Nagara Panchami pujas are held at Kudupu Ananthapadmanabha Temple (on the way to Moodbidri from Mangalore) and Kukke Subrahmanya Temple.